What if you could find current, concise drug information quickly without having to search through an enormous amount of content? With Lexicomp® from Wolters Kluwer Clinical Drug Information, you can do just that. Mobile Apps: Lexicomp drug information is available as a mobile app for smartphones and tablets. Mobile packages feature multiple indexes to expedite searching, and advanced navigation to save valuable time. 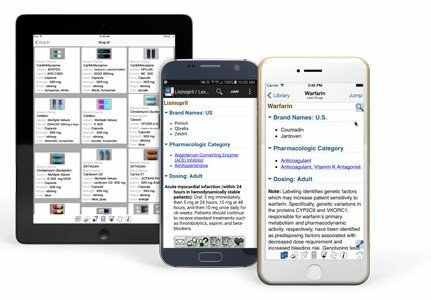 Printed Drug References: Choose from an extensive library of drug information handbooks and clinical diagnostic manuals, compiled specifically for the busy healthcare professional or student. Online Access: Lexicomp also offers online access to included databases. When you need fast answers to drug questions, leverage trusted content from the industry's highly respected drug information leader whether you are at your work station or on the go. What do Lexicomp subscribers have to say about Lexicomp? "Lexicomp Online for Dentistry is accessible anytime throughout my busy day. Lexicomp allows me to research a patient's list of medications quickly so that I can focus on their appointment with the comfort of knowing I have accurate and detailed information. Lexicomp makes the day run smoothly and allows me to easily access important information to give the best care to each and every one of my patients." * Terms and conditions apply. This email is applicable to those who have never subscribed to Lexicomp. Prices and offer are subject to change without notice. Taxes are additional. Contact customer service at 1.855.633.0577 Monday-Friday 7 a.m. – 9 p.m. (EST) for more information.